Just as a pediatrician specializes in children’s health, pediatric dentistry practitioners are experts in the growth and development of children’s mouths into the teen years and onward into adulthood. We can identify problems such as early decay or crowded teeth and correct them before they do major damage. The American Academy of Pediatric Dentistry suggests that a child’s first dental visit should occur by age 1. 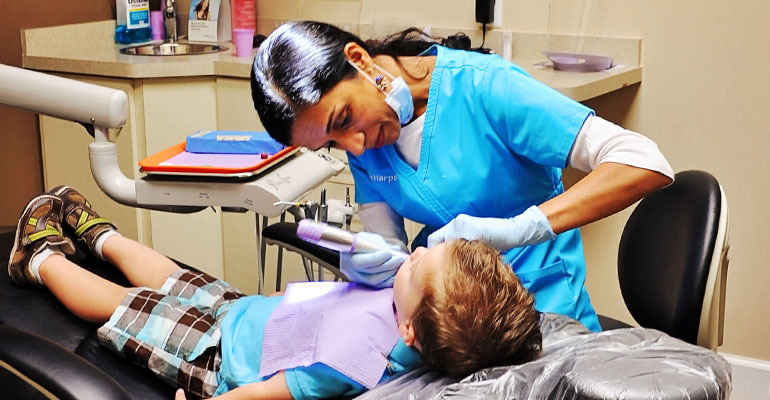 Dr Harpavat and her staff know as much about children as they do about children’s dentistry. They’ve been through extensive training in child development and child psychology, which means they can ease kids’ fears about dentists and make visiting the dentist a fun, positive experience. The specialized care that we offer here at Memorial Family Dental can make a big difference in the way your child feels about going to the dentist. That can have a major impact on the way they care for their own teeth. We are committed to helping kids learn how to properly care for their teeth and develop the good brushing habits that get their smiles started out right. We are also committed to keeping our education current and up to date. We complete many extra hours in continuing education courses annually so that we can provide the best equipment and techniques for our patients.